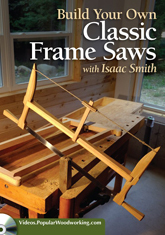 A step by step guide to building two frames saws; the first, a Roubo style frame saw, and the second, a Danish style frame saw. Tuning and use of the saws is also briefly covered. The video is available in both DVD and downloadable formats. DVD orders will be processed and shipped with the rest of your Blackburn Tools order; digital downloads will be processed and completed separately on Popular Woodworking's online store.